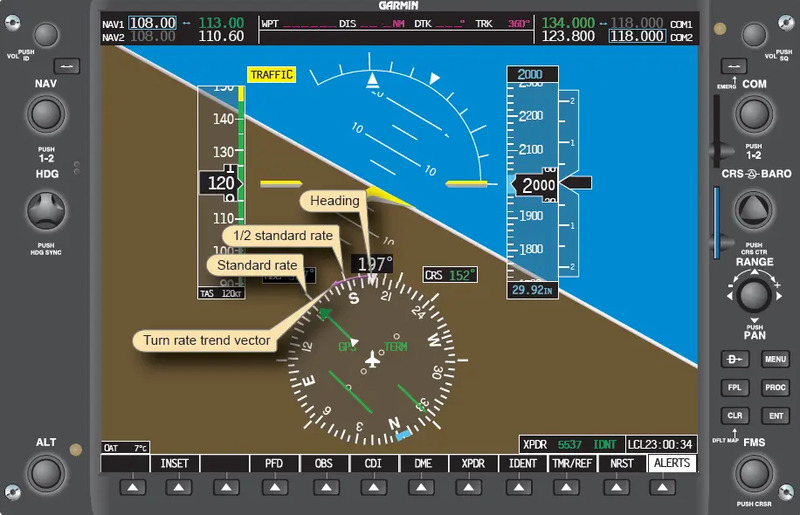 Since most of the primary and supporting aircraft attitude information is displayed on the PFD, standard scanning techniques can be utilized. It is important to remember to include the stand-by flight instruments as well as the engine indications in the scan. 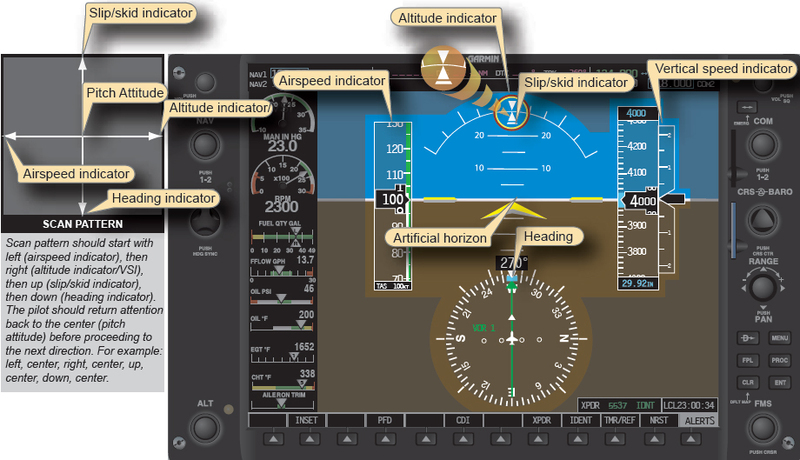 Due to the size of the attitude instrument display, scanning techniques have been simplified because the attitude indicator is never out of peripheral view. The radial scan pattern works well for scanning the PFD. The close proximity of the instrument tape displays necessitates very little eye movement in order to focus in on the desired instrument. 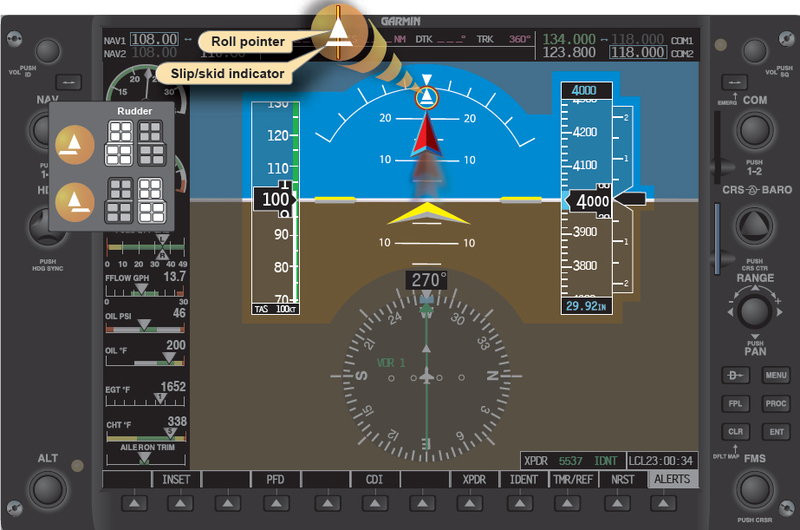 While the eyes move in any direction, the extended artificial horizon line allows the pilot to keep the pitch attitude in his or her peripheral vision. This extended horizon line greatly reduces the tendency to fixate on one instrument and completely ignore all others. Because of the size of the attitude display, some portion of the attitude indicator is always visible while viewing another instrument display on the PFD. While scanning that region, check the roll pointer and assure that the desired degree of roll is being indicated on the bank scale. The roll index and the bank scale remain stationary at the top of the attitude indicator. The index is marked with angles of 10°, 20°, 30°, 45°, and 60° in both directions. If the desired bank angle is not indicated, make the appropriate aileron corrections. Verify the bank angle is correct and continue scanning back to the yellow chevron. Scan left to the airspeed tape and verify that the airspeed is as desired, then return back to the center of the display. Scan right to the altimeter tape. Verify that the desired altitude is being maintained. If it is not, make the appropriate pitch change and verify the result. Once the desired altitude has been verified, return to the center of the display. Transition down to the heading indicator to verify the desired heading. When the heading has been confirmed, scan to the center of the display. It is also important to include the engine indications in the scan. Individualized scan methods may require adjustment if engine indications are presented on a separate MFD. A modified radial scan can be performed to incorporate these instruments into the scan pattern. Another critical component to include in the scan is the moving map display located on the MFD. To aid in situational awareness and facilitate a more centralized scan, a smaller inset map can be displayed in the lower left corner of the PFD screen. Figure 6-35. Airspeed trend indicators. One improvement the glass panel displays brought to the general aviation industry is the trend vector. 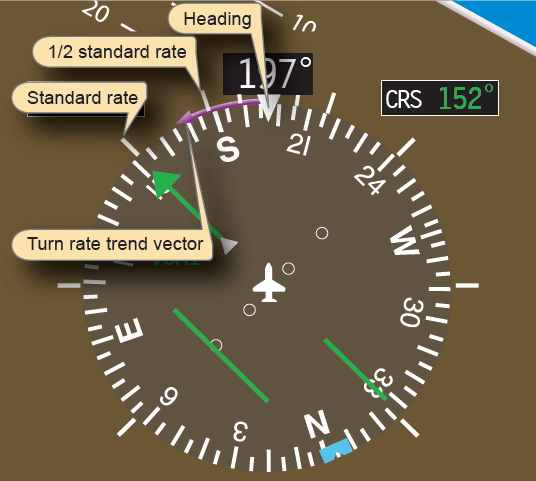 Trend vectors are colored lines that appear on the airspeed and altitude tapes, as well as on the turn rate indicator. The color of the line may vary depending on the airplane manufacturer. For example, on a Cirrus SR-20, the trend vector lines are magenta and on the B-737 they are green. These colored lines indicate what the associated airspeed, altitude, or heading will be in 6 seconds for the Cirrus SR-20 and 10 seconds for the B-737 if the current rate is maintained. The example shown in Figure 6-35 uses the color and data that represents the trend vector for a Cirrus SR-20. The trend vector is not displayed if there is no change to the associated tape and the value remains constant [Figure 6-36] or if there is a failure in some portion of the system that would preclude the vector from being determined. Figure 6-36. Airspeed indicators with no trend present. Figure 6-37. Altimeter trend indicators. Another advancement in attitude instrument flying is the turn rate trend indicator. 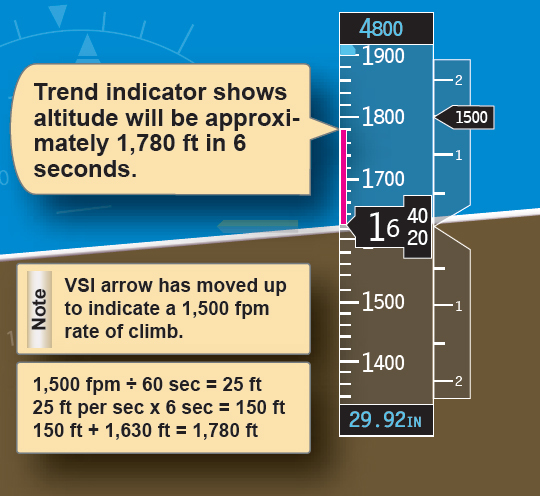 As in the cases of airspeed, altitude, and vertical speed trend indicators, the turn rate trend indicator depicts what the aircraft’s heading will be in 6 seconds. While examining the top of the heading indicator, notice two white lines on the exterior of the compass rose. [Figure 6-38] These two tick marks located on both sides of the top of the heading indicator show half-standard rate turns as well as standard rate turns. In Figure 6-39, when the aircraft begins its turn to the left, the magenta trend indicator elongates proportionally with the rate of turn. To initiate a half-standard rate turn, position the indicator on the first tick mark. A standard rate turn would be indicated by the trend indicator extending to the second tick mark. A turn rate in excess of standard rate would be indicated by the trend indicator extending past the second tick mark. 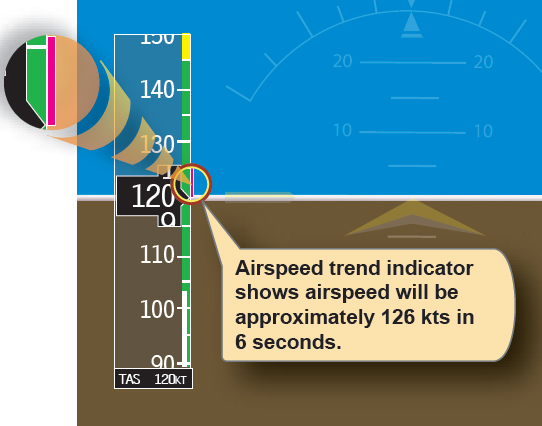 This trend indicator shows what the aircraft’s heading will be in 6 seconds, but is limited to indicate no more than 24° in front of the aircraft or 4° per second. When the aircraft exceeds a turning rate of 25° in 6 seconds, the trend indicator has an arrowhead attached to it. Figure 6-39. HSI indicator (enlargement). 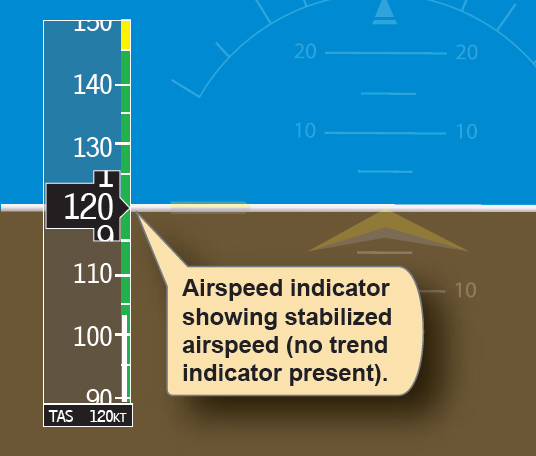 Trend indicators are very useful when leveling off at a specific altitude, when rolling out on a heading, or when stabilizing airspeed. One method of determining when to start to level off from a climb or descent is to start leveling at 10 percent of the vertical speed rate prior to the desired altitude. As the aircraft approaches the desired altitude, adjust the pitch attitude to keep the trend indicator aligned with the target altitude. As the target approaches, the trend indicator gradually shrinks until altitude stabilizes. Trend indicators should be used as a supplement, not as a primary means of determining pitch change.